WISC - What is WISC? Welcome International Students of Cambridge (WISC) is an informal, non-profit, goodwill-based organization registered with the British Council in Cambridge, England and aimed at promoting relationships and interaction between international students at Cambridge University and local families. We have a list of families in Cambridge and the surrounding villages, who are happy to invite international students over to spend the day with them, enjoy a meal and learn about each other's country. 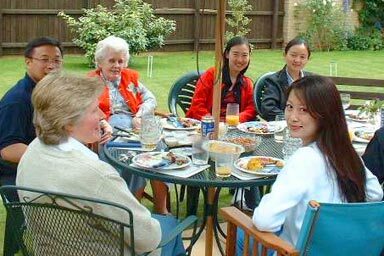 Some of these families have enjoyed hospitality abroad and are eager to reciprocate the kindness. Simultaneously, students will also give hosts a personal insight into other parts of the world. 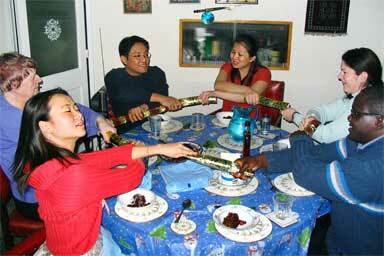 Well, it is not just a one-off thing - some students become good friends with their host families and now have a home to visit whenever they feel homesick or lonely, particularly during the Christmas and Easter vacations when the colleges tend to be empty.